ST. GEORGE — A swarm, or cluster, of 24 earthquakes have been recorded Tuesday, the first about 37 miles west-northwest of St. George in Nevada, and the others within about a 10-mile radius of the first, see map inset. The earthquakes have ranged from local magnitude 4.1 at both 8:20 a.m. PST and 6:30 p.m. PST, and various lesser amounts throughout the day with the most recent registering local magnitude 3.2 at 6:38 p.m. PST. The epicenters of Tuesday’s quakes in the region were in a remote section of Southeastern Nevada near the Utah border. Caliente, Nev. – 24 miles from the first epicenter – is the nearest town with any significant human population. The 2010 U.S. Census lists Caliente’s population at 1,130. St. George News spoke with Bill Lund, senior scientist with the Utah Geological Survey after the first quake registered. But, Lund said, if it was one notch up on the earthquake magnitude scale, like St. George’s well-known 1992 magnitude-5 quake, it could do some major damage. The 1992 quake didn’t rupture the surface but it did create heavy landsliding and rock falls. One of the landslides from this quake destroyed a few homes and a water tank in Springdale. Faults that contribute to these quakes span throughout the St. George area – specifically in the Hurricane and LaVerkin areas. These faults are capable of producing quakes far larger than a magnitude 4, Lund said. The size of today’s magnitude 4.1 morning quake, ergo its evening quake as well, while notable is not unusual in this area. In fact, this region gets about one magnitude 4 every one to one and one-half years, Lund said. 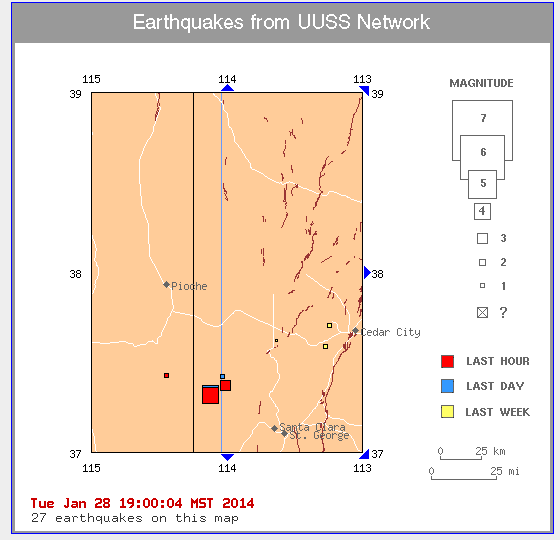 About two years ago, a magnitude 4 quake occurred near Cedar City and shook the town. “I thought that somebody had accidentally run into our building with their car,” Lund said, who was in Cedar City at the time. Magnitude-4 quakes are very noticeable especially when you’re near the epicenter. Quakes are a reminder that the whole Basin and Range region – the western part of Utah through Nevada and into Eastern California – has numerous potentially active faults. However, today’s quakes should not worry anyone. Smaller quakes can be precursors to larger events but the probability is low on this one, Lund said. The basin and range portion of Utah, Nevada and California is being slowly but inexorably pulled apart, Lund said. That pulling apart puts all the land under a lot of strain. Every once in awhile the strain exceeds the strength of the rock and we have an earthquake. “This is exactly the kind of earthquake we would expect in this part of the world,” Lund said. For info on earthquake preparation and more facts about earthquakes in this area click here for Utah’s earthquake handbook. Updated 8:10 p.m. Earthquakes listed as occurring Wednesday corrected to Tuesday, Jan. 28.
um, isn’t northwestern Nevada Reno? Don;t you mean eastern? Correction made, Char – it is southeastern. Thank you so much. The 4.1mb quake,may be considered as an indicator of further more tremors in the region.USGS had announced Mega quake in California bydecember2013/or Jan 2014. I had informed nothing like that is expected,only some climate-changes may take place,My prediction of Noquake,has come true,however further increase in small tremors may increase possibility of a quake4to6mb.within a fortnight,please note&respond.